Looking for some fresh decorating ideas in color for giving your fall front porch and entry an inviting look? Instead of decorating for fall with the expected orange, brown, and yellow colors, how about using mums in colors that go with your front door? Then adding pumpkins and gourds in green and white? I have some ideas to share with you for how to add great Fall decor in unexpected colors. And, over 20 other bloggers are also sharing fabulous ideas for Fall. 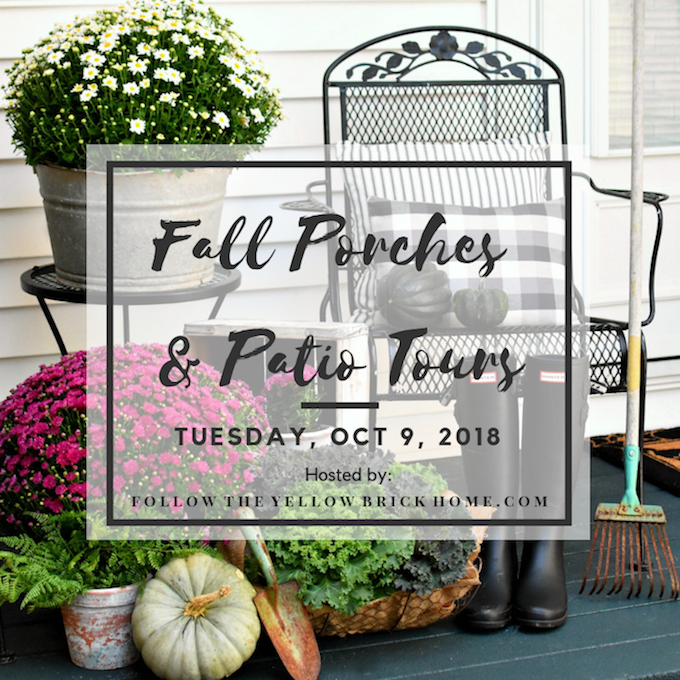 One of my good blogging friends and fellow lover of French Country, Amber of Follow the Yellow Brick Home, is hosting a tour all about Fall GREAT OUTDOORS. And she invited me to join in the fun! Isn't Fall spectacular?! See the links at the end of the post for more Fall decorating inspiration from all across the country. 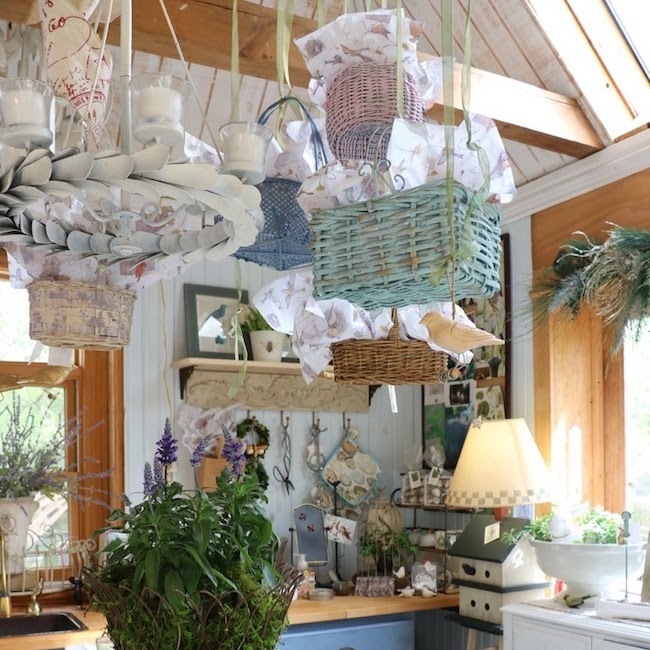 Are you coming from Laura at Decor to Adore with her Fall in Love With France home tour? Then you know one of the many reasons Laura and I are good friends . . . We both love France! But, that is not the only reason. She is a beautiful, gracious lady who spreads sunshine with her cheerfulness and support of others. Laura and I live close enough to meet for lunch with one another and our other north Texas blogging friends. We always have a good time eating, laughing, and sharing ideas with one another. Now, time to see those decorating ideas in color I promised. Keep reading to see how I refreshed my entry garden and took the front entry from plain functional to an inviting colorful entry decorated with Fall colors . . . that complement my front door. Compare how my front entry and front porch looked BEFORE with how they look AFTER decorating with unexpected fall colors. The front porch and entry walkway were clean, functional, and rather plain. They did have the beautiful blue door and a coordinating flower pot going for them. And there were a couple of nice swans. Plus the siding was freshly cleaned. But, they needed more life! More color that said, "Welcome. Come on in." 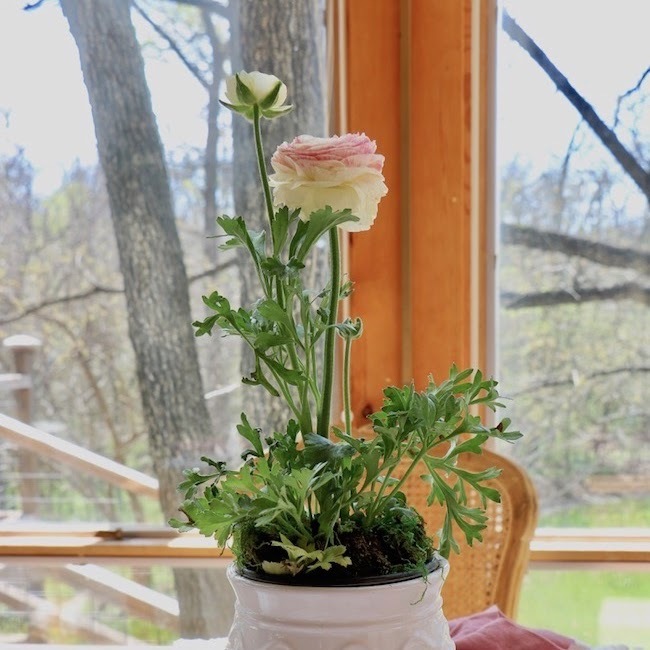 Now the mums, ornamental kale, pumpkins, and Bonjour bucket of flowers on the door say, "Bonjour," with a French Country accent. The first step was to clean the entire area including power washing the cedar siding. All of the cedar siding looks brighter and inviting, but the window wall was bare, a blank canvas with no personality. A new French Country inspired window basket filled with Fall ornamental kale, ivy and violas immediately changed the look of the entry. 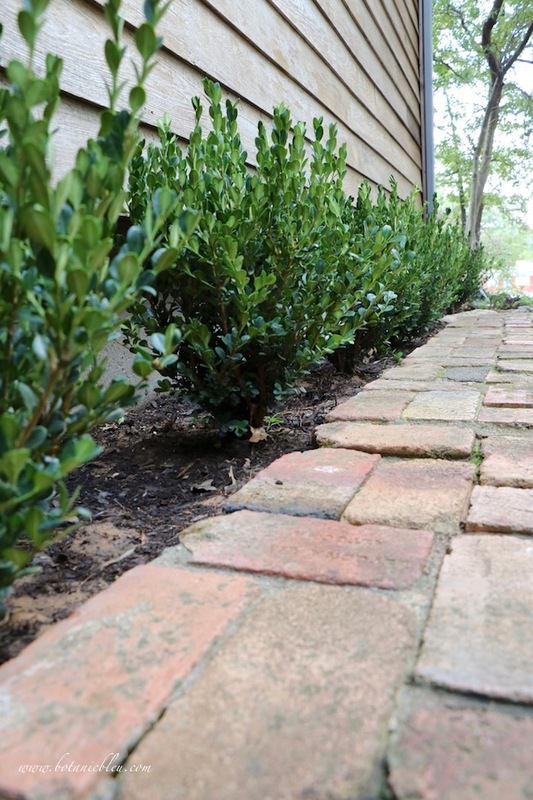 To add a little more French Country to the entry garden, we planted boxwoods. Not only under the new window basket, but also along the sidewalk next to the house. The clumps of lirope were too small for the space. New boxwood shrubs fill the space, but can be kept from spilling over onto the sidewalk as they grow by pruning them into ball shapes. We plan to wait until spring to prune them to prevent new tender growth that could be killed when cold weather arrives. With the plant structure of the entry garden defined, we turned our attention to the concrete bench, porch, and seasonal color. 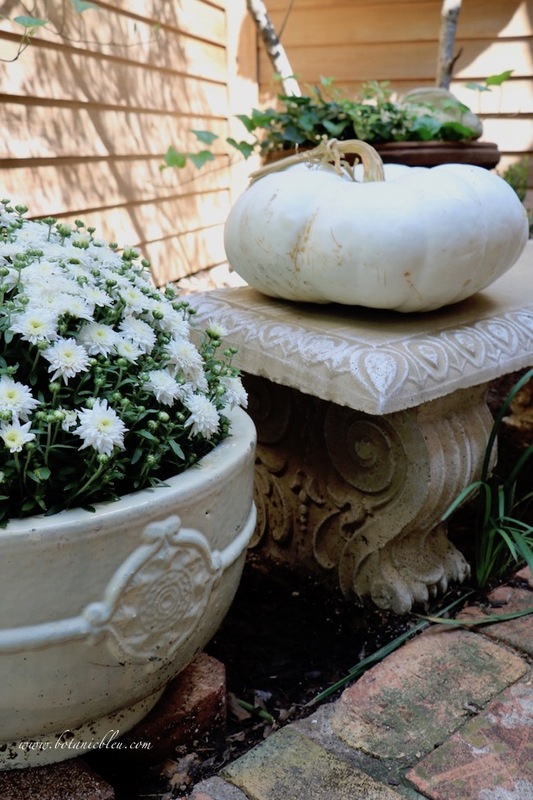 Two new French style urns on either side of the concrete bench hold white chrysanthemums for Fall, but can easily be changed to hold other seasonal decor all year. Isn't this white pumpkin with twisty stem the best?! 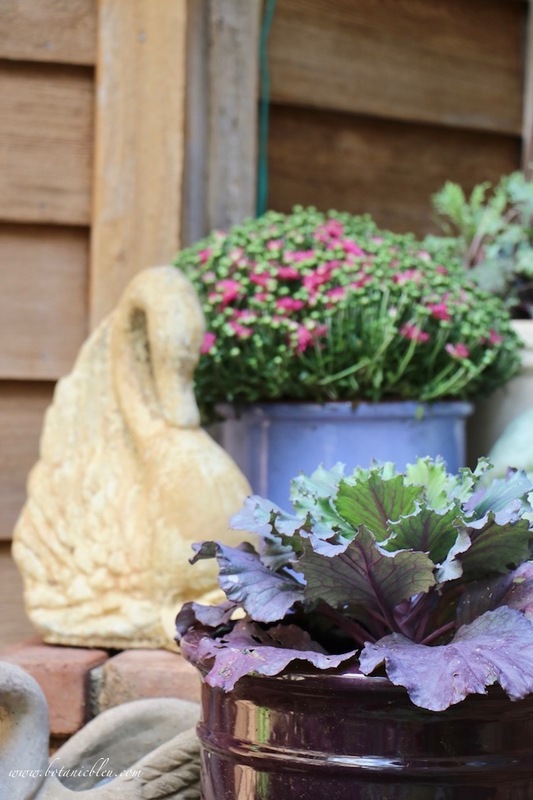 Paler purple mums in a blue pot add additional spots of color on the porch steps. I used pots designed for indoor use to hold several of the Fall porch plants. If you do the same, remember to empty the pots frequently so the plants do not sit for long periods of time in rain water. 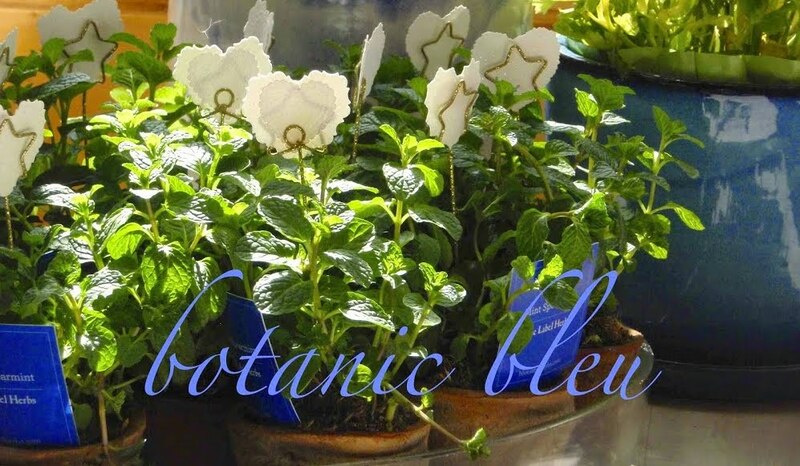 Not only do you want the plants' roots to breathe, you do not want a breeding spot for mosquitoes. 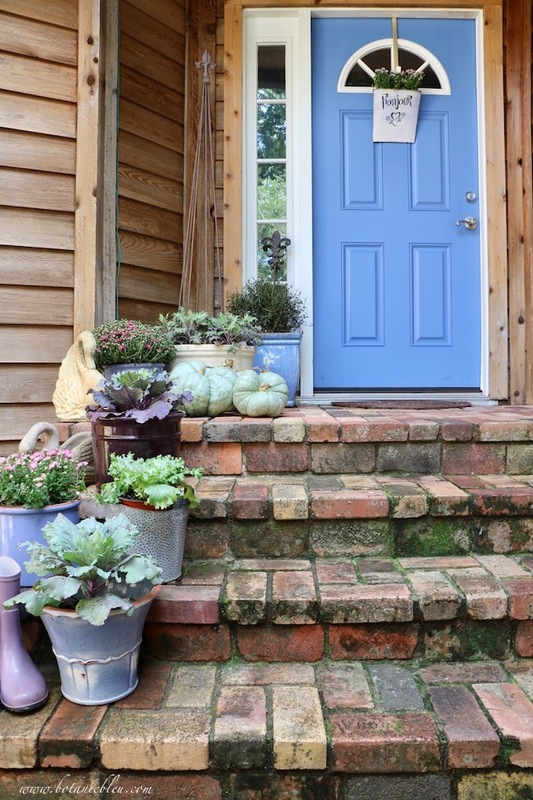 Repeated use of blue pots helps with a cohesive look for the steps and porch. Instead of lining up the pots of the same color, I interspersed them with other containers in a staggered pattern up the steps. 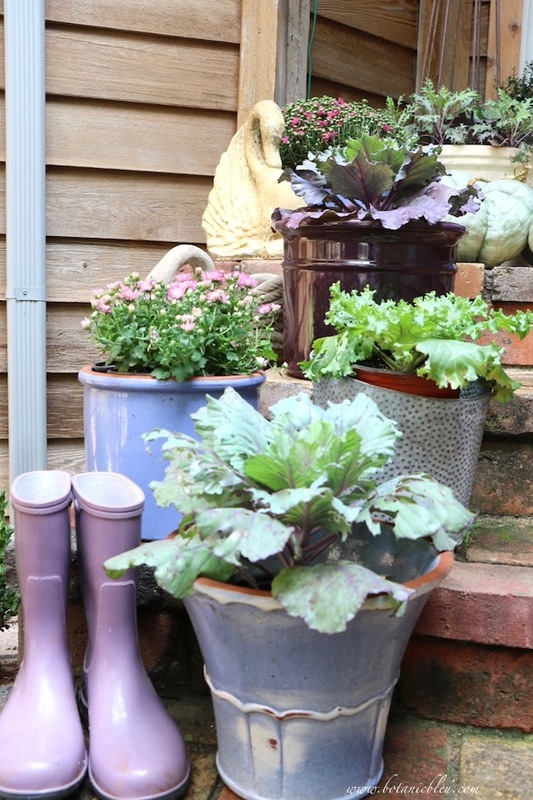 Pale lavender gardening boots add another complementary spot of color with the plants and flower pots. If you use boots in your Fall decor, remember to move them to a sheltered spot if rain is forecast. You don't want squishy boots just when you need to wear them during a rain. The front entry garden, steps, and porch now welcome us and visitors with cheerful alternative Fall colors that go well with the color of the front door. And, I did not forget the front porch and front door. 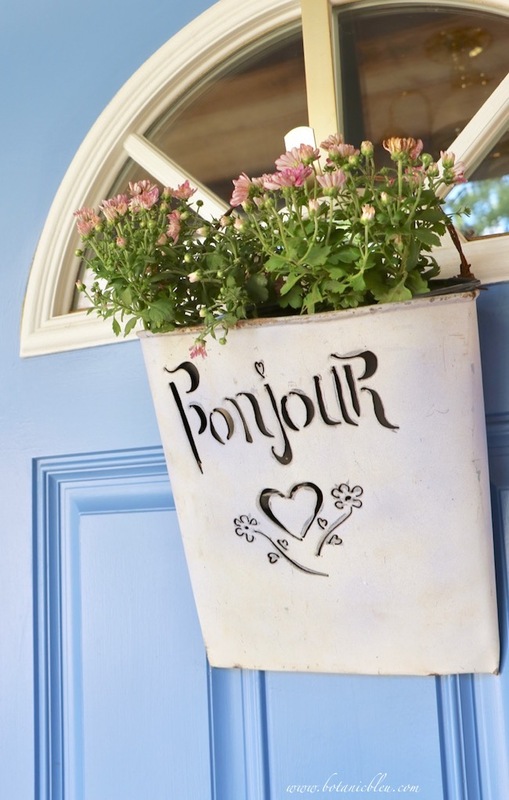 Two fleur de lis and a "Bonjour" metal bucket provide the French Country style I love. 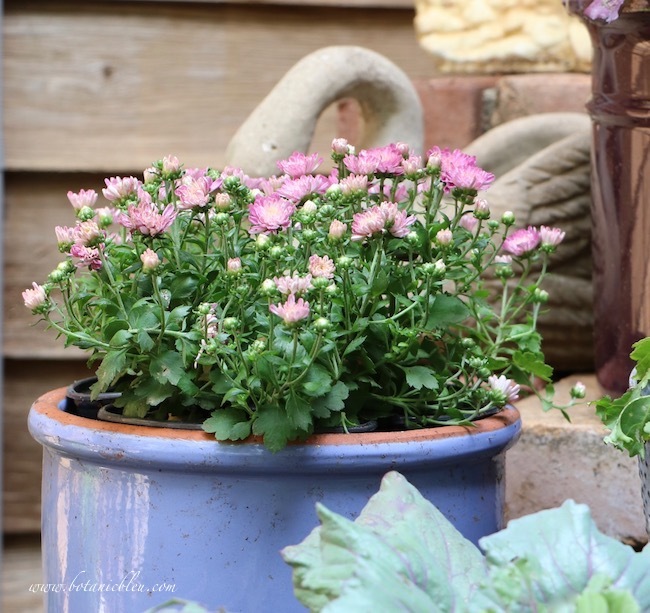 Small bedding plant mums in the same colors as used on the steps fill the Bonjour bucket. TIP: Keep the small bedding plants in their original small pots, and place them inside a large zip-lock plastic bag inside the bucket. 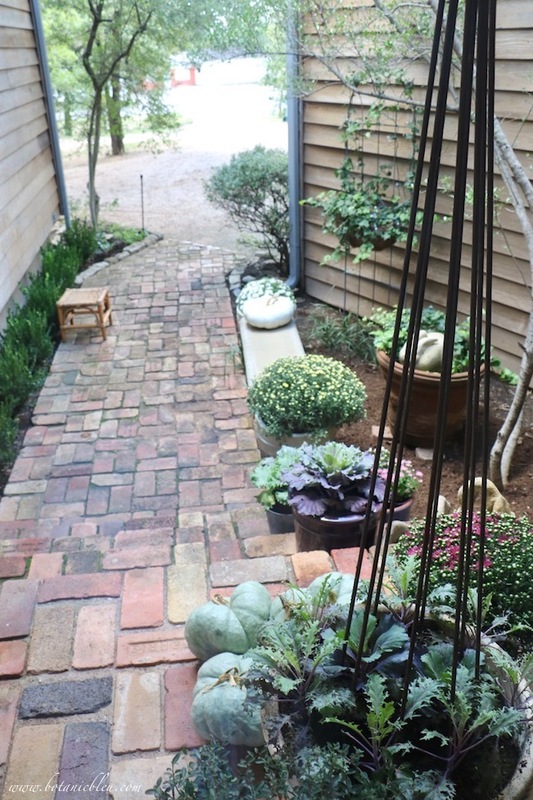 When you water the mums, the plastic bag keeps the water from draining down the front door. 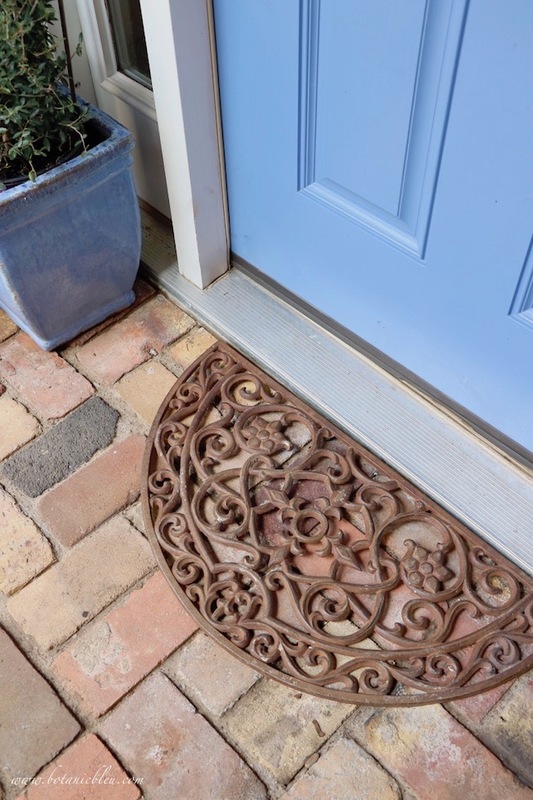 A semi-circular iron doormat can take a beating from the weather and from shoes being scraped on it and will last years. Fleur de lis are also part of the scroll design. Our new plants and Fall front porch look good both from walking up the sidewalk and from looking out through the entry's sidelight window . . . even on drizzly overcast days. 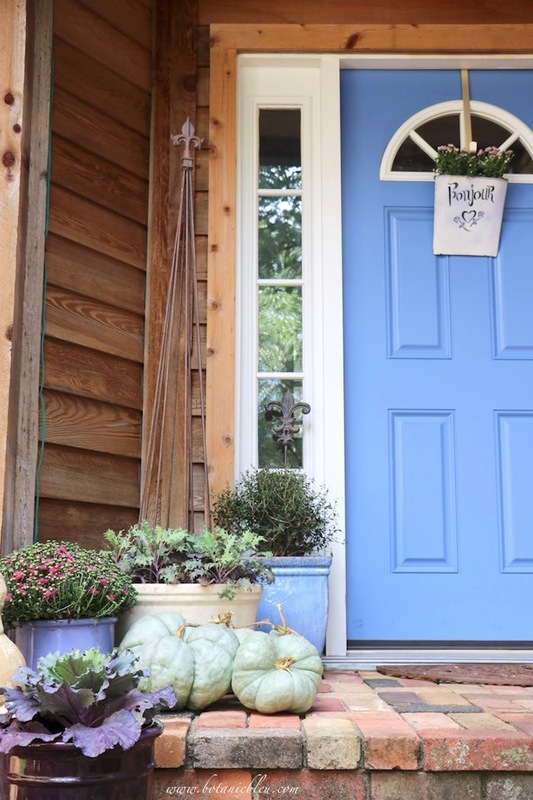 With all the heirloom pumpkins and cool-weather vegetables and flowers now available at garden centers, you should be able to find a collection of colors that will go with your front door for decorating for Fall. Try something new . . . and unexpected. 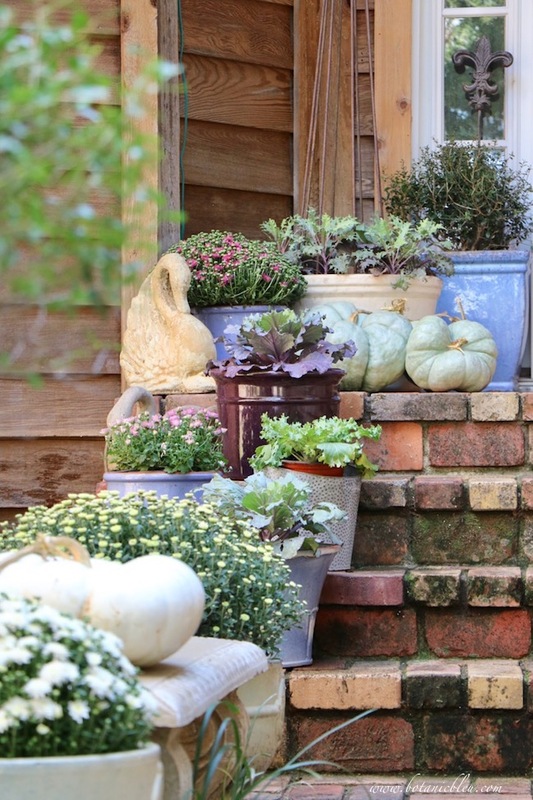 For more Fall inspiration, check out Petite Haus that is next on the tour with more Fall Porch Decor. 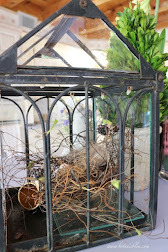 Angelina is also a fellow lover of all things French, and I always come away with ideas from her French-inspired decor. Then be sure to see all the other great ideas shared in the links at the end of the post. 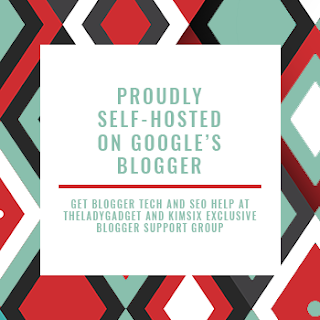 Please share ⥣ on your Pinterest, Instagram, Facebook, & Blog sites. ① Check back on Thursday when I share my French Inspired Fall Living Room as part of the Fall in Love With Texas home tours. ② Take a look at my Pinterest board, Fall. And, while there, take a look at my other boards. I would love for you to follow me on Pinterest. I am finding new pins everyday, and Christmas pins are popping up more and more. ③ Want to make sure you see every post? Then sign up to receive every post delivered straight to your email inbox. Enter your email address in the BLUE BOX at the top of the right sidebar. Thanks for reading, commenting, and following. I am THANKFUL for all of you. Love the brick path and porch steps. They are so pretty and add lively color to your fall accents. Just perfect! Happy touring!! Oh, my! That gorgeous French Country blue door stole my heart! What a lovely welcoming fall entrance! What a beautiful entry. Love the bench and all the pretty plants and pumpkins. Such an inviting and lovely way to greet your guests. So pretty! Such a welcoming entryway! I love the unusual colors...they are perfect with your walkway and door color! 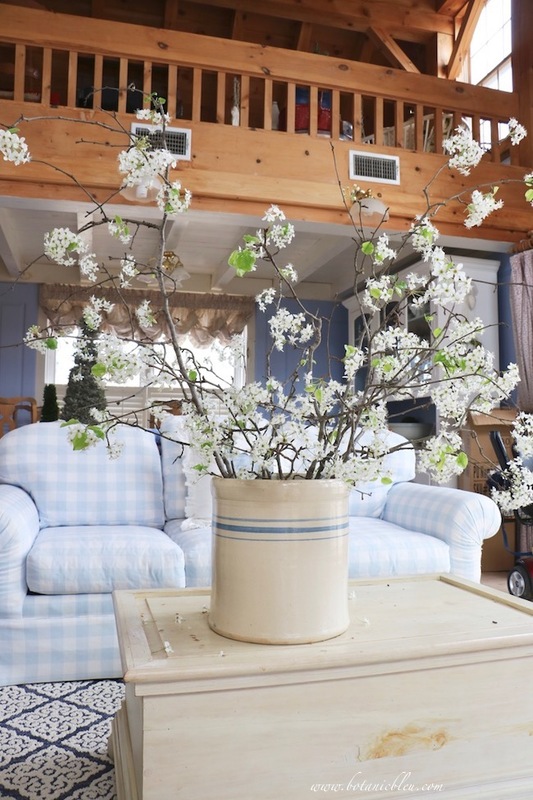 Judith your entryway makeover is FABULOUS! It truly says "Bonjour". I too share your love of fall decorating in anything other than orange. You have inspired me in so many fun ways. Your entryway looks beautiful for fall. 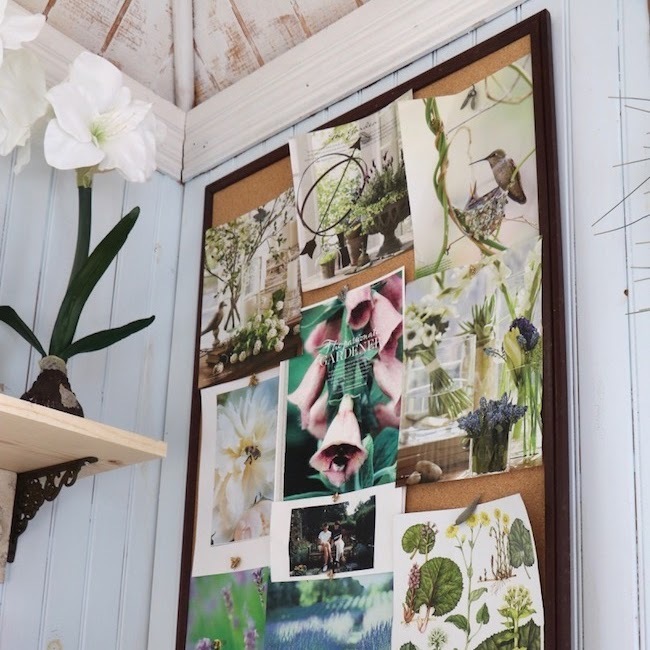 All of the updates that you gave this space make it charming and I know that any guests who approaches your home has to stop to admire your pretty outdoor decor. Judith, all the sweet details you added to your walk up and porch make it the front door a beautiful destination. First of all I love the antique bricks on your porch. Your plants are all so pretty and I think you win the prize for the best pumpkins! Wowza, what a difference a year makes! I'm so jealous of your green thumb too. Your porch with all its color is so festive and inviting at the same time. Simply gorgeous! 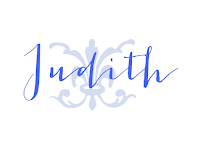 Judith, beautiful mix of French blues and lavenders on your entry. I love the new boxwoods replacing the liriope. The ornamental kales really pull it all together with choice of pumpkins. Beautiful! 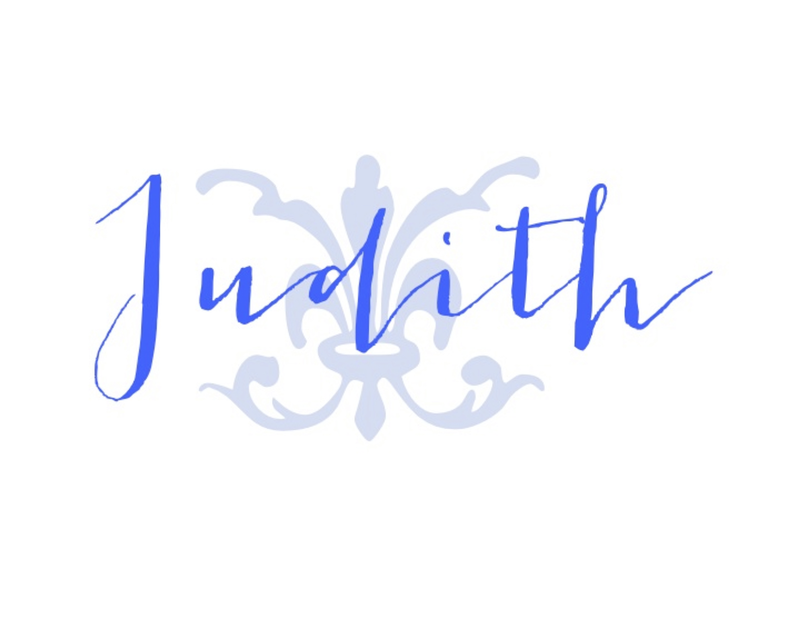 Hey Judith! 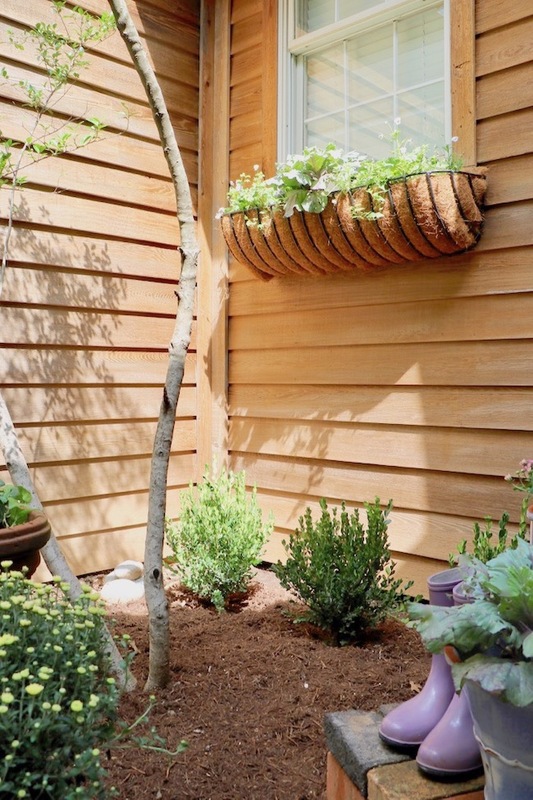 I love your neutral fall porch! I especially love the purple and violet touches. Purple/violet is the trendy fall colors this year. Happy to be on this tour with you! 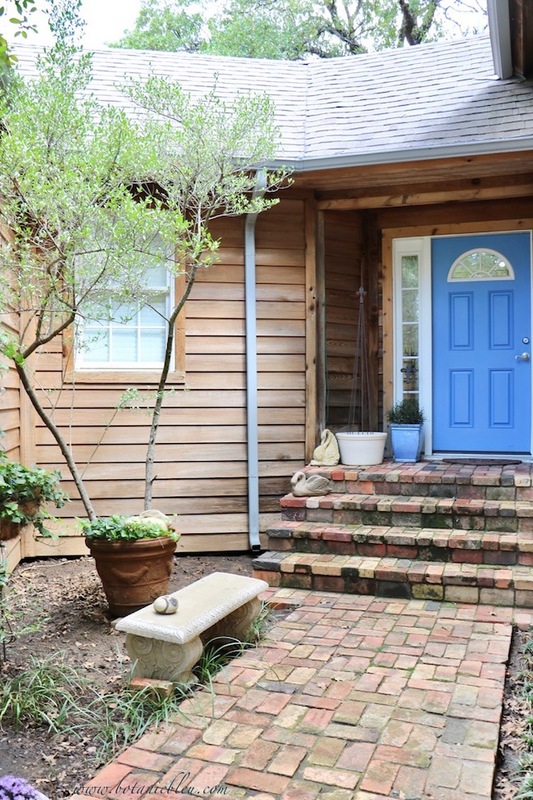 Oh my how I love your cool colors and your porch and walkway refresh! This is such an inspiring post full of useful tips and ideas! 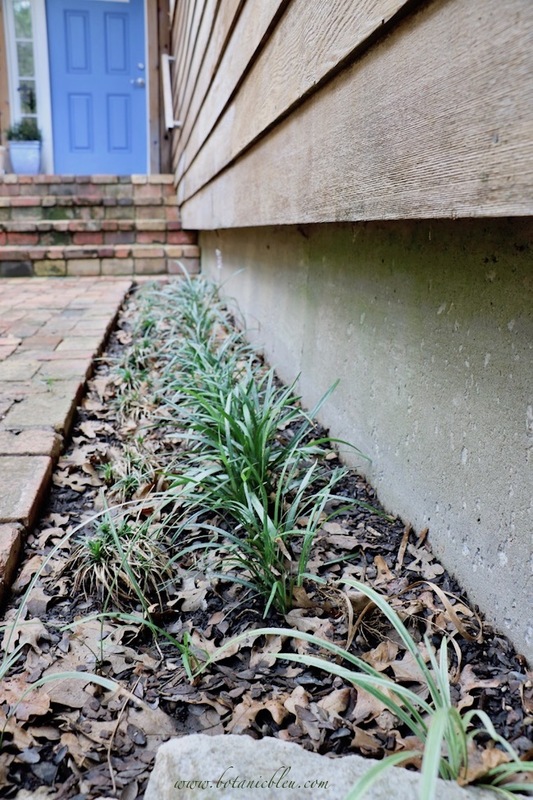 We are redoing the flower beds on each side of our porch and there is a weird negative space where plants won't work. Eureka! A garden bench! 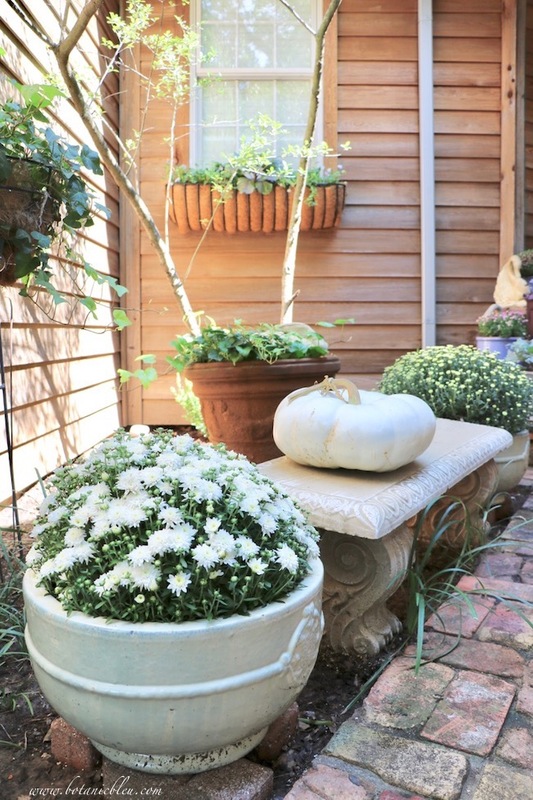 Those white mums and in the urns and white heirloom pumpkin on the bench are beautiful! Oh my autumn kale loving heart be still! I haven't gotten my kale fix yet since I didn't find all the different varieties in time for the tour.I did share several on my back porch but I simply must have a few more! Plenty of time left though. Kale lasts through December in Kentucky. Love the window box, iron door mat and the purple boots might just be my favorite touch. So happy to have you touring with us again. Happy fall! Judith, what a wonderful redo to your front porch! Funny how mums and pumpkins can make such a difference, but they do. I always look for the best stems on pumpkins. :) You got some beauties!! 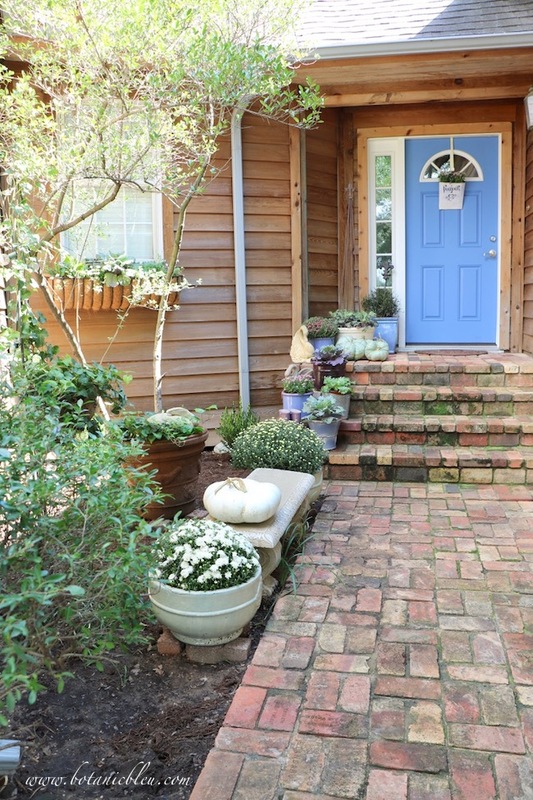 Judith, the entry to your home looks absolutely gorgeous with your pretty plants, flowers, and pumpkins! What a wonderful welcome to greet your guests! It has been so much fun to be on the tour with you! Happy Fall!!! Judith, I love your decor and those colors are fabulous! I'm always looking for different colors to use in decorating for the seasons and holidays! Great choices! What a beautiful transformation! I love everything that you did here, and love the softer fall version colors-perfect for your climate. Your post and beam home is just divine! Your fall porch is beautiful! But, I have to say I'm totally jealous of all you Texas bloggers getting together. What a pretty and welcoming entryway! Perfect alternative to orange, love the green pumpkins!! I love the non-traditional colors you added to your fall porch! I absolutely love your brick walkway and steps! So fun to join you on this tour! 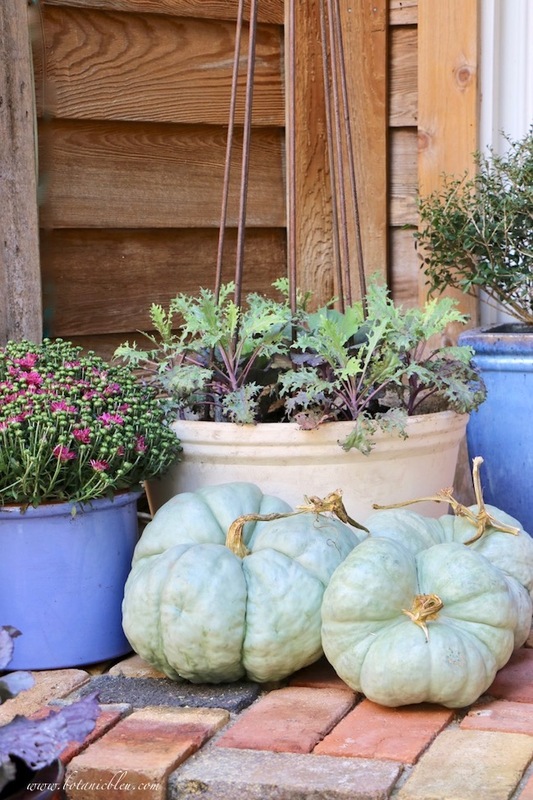 Your blue font porch and blue pots are a great pop of color and meld lovely with the greens and grays of the cabbages and the green pumpkins. It is lovely to see how fall can be expressed without a pop of orange or yellow! Happy Fall!